The growth of the economy in the 1990s was due to the partnership and proprietorship firms in service activities and not due to reforms pertaining to the government or the minuscule corporate sector. The non-corporate sector dominates the service activities and is the fastest growing sector in the economy. The size of this sector in service activities and the phenomenal growth rates achieved in the 1990s need recognition. IN THE third part of this series, we find that the non-corporate sector dominates the service activities which constitute half the economy. These are also the fastest growing activities and, hence, the non-corporate sector can be termed the engine of economic growth and the Indian economy can be called Partnership and Proprietorship economy (P&P economy). The growth of the economy in the 1990s was due to the partnership and proprietorship firms in service activities and not due to reforms pertaining to Government or the minuscule corporate sector. This remarkable contribution of the P&P sector has not been adequately documented and appreciated. Whenever the term service sector is mentioned, many think of IT services and recall companies such as Wipro or Infosys. Factually, all software-related activities come under business services, which itself is less than 2 per cent of the national income. Service sector covers a much larger canvas and is the fastest growing sector in the economy with a large employment. 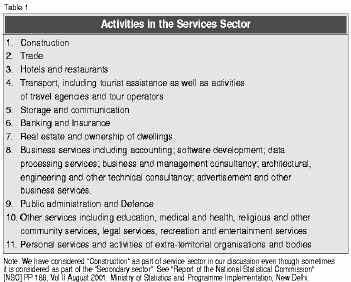 The activities comprising the service sector are give in Table 1. This sector encompasses diverse activities carried on by large multinationals as well as street-side entrepreneurs. Nearly half the GDP is due to the service sector (Table 2). 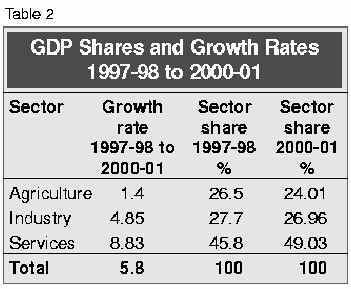 In 1997-98 to 200-01, the service sector grew at 8.83 per cent, much higher than other sectors. Between 1950-51and 1990-91, the share of the services sector to GDP rose by only 13.07 percentage points, an increase of about 0.33 percentage points per annum. However, between 1990-91and 1999-2000, the share had increased by 7.29 percentage points, which is an increase of 0.81 percentage points per annum. Clearly, the growth rate is very significant in the 1990s (NSC 2001:186). It is generally accepted that the economic reforms were initiated in the early 1990s but most of the policy changes were pertaining to manufacturing and financial sector dealing with the corporate activities. The regulations and control pertaining to the service activities are with the State governments and there are no reforms in these. Hence, it is difficult to ascribe the growth of the service sector and that of the entire economy during the 1990s, to the reform measures initiated. The role of non-corporate sector is very significant in seven of the activities, listed in Table 1, namely (1) construction, (2) trade, (3) hotels and restaurant, (4) non-railway transport, (5) storage, (6) real-estate ownership of dwellings and business services, and (7) other services. The share of these seven major service sectors in the NDP for different years has consistently gone up from 30 per cent in 1960-61 to 41 per cent in 2000-2001, showing an increase in the role of these activities in the economy during the period but, more particularly, in the 1990s(Table 3) As pointed out by the National Statistical Commission (NSC), although the services sector has such a pivotal role in the economy,the database of this sector is highly disorganised. There is no well-organised mechanism for maintaining a regular and proper database for this sector. The services sector can be broadly classified into three segments — the public sector, private corporate and the `household’ sector. The first two are considered `organised’ and the rest consists of all unincorporated enterprises, including all kinds of proprietorship and partnerships run by individuals. The database for the organised sector is mainly the published accounts of the corporate and government entities. The NSC points out that the estimates of gross value added per worker, based on the follow-up enterprise surveys of Economic Census (EC) periodically conducted by the Ministry of Statistics and Programme Implementation (MoS&PI), are often too low. Also, the estimates of the number of workers in different sub-sectors, as per these surveys, differ widely with those available from other sources such as the employment-unemployment surveys of the National Sample survey organisation (NSSO) and decennial population census. Table 4 shows the share of non-corporate sector in the seven activities such as wholesale and retail trade, hotels and restaurant, road transportation, real-estate and business services such as medical, legal and so on. The share of the unorganised sector is more than 80 per cent in trade (wholesale and retail) hotels and restaurant, and business services. It is more than 75 per cent in non-Railway transport and more than 50 per cent per cent in construction and storage. It is pertinent to point out that the estimates of non-corporate sector in these activities need substantial improvement. As already noted, for instance, the report of the NSC 2001 points out **that the estimates of the non-corporate service sector is based on data which suffer from an inadequacy in terms of sampling frame and sample size. Unlike the developed countries, the likes of Wal-Mart, Sears, or Marks and Spencer in retail trade, or Greyhound or Federal Express in transportation, or McDonalds or Burger Kings and Pizza Huts in restaurants, are not as yet the order of the day here. The issue of entry of MNCs in these activities will be dealt with later. The size of the non-corporate sector in service activities and the phenomenal growth rates achieved in the 1990s needs recognition. In a sense, the Indian economy can be called Partnership and Proprietorship (P&P) economy. There are some moves to enhance the taxation on these activities through income-tax or service tax in the coming Budget. There is a witty saying in the army that to move up the ranks what needs to be done is “Salute all things moving and paint all things standing”. In the same vein, governments attempt to control and regulate an economic activity if they do not understand it and tax it if they are growing faster. This only shows the ever-increasing needs of the government mostly for salary and pension of its employees. But gargantuan government goes against the grain of our civilisational ethos and negates the entrepreneurship of the P&P economy. The Communists are arguing for de-toxification of the text-books but what is really needed is the de-taxification of the economy. The growth and development of the P&P sector needs to be calibrated taking into account issues of credit delivery, labour markets, social security, savings and investments, globalisation, cohesion of civil society, and so on. In the following parts of this series, these aspects of our P&P economy will be discussed.